Our event specialists share their expertise for kick starting your wedding planning! First of all, congratulations! 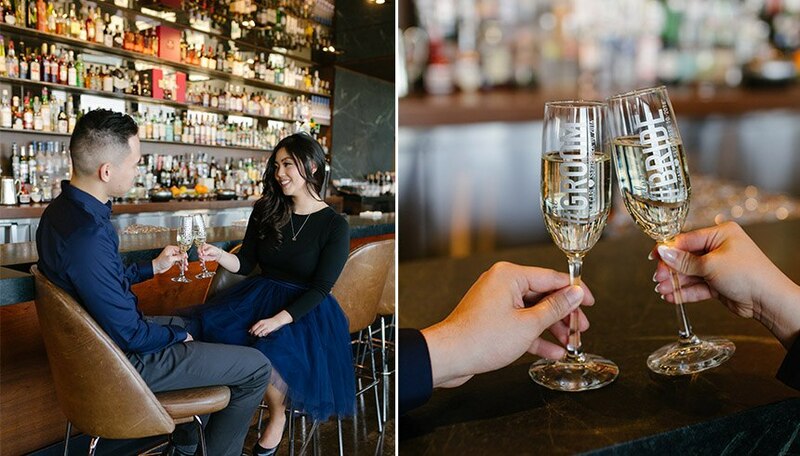 Getting engaged is a huge milestone, and one worth savouring. After sharing the exciting news with your nearest and dearest family and friends (oh, and posting an #isaidyes selfie on Insta), you’re probably feeling a little overwhelmed about what to do next. We checked in with our team of event specialists for their advice on which wedding planning steps to tackle first. If you’re hoping to tie the knot within the next year or two, it’s best to nail down the date sooner rather than later! It’s good to have two or three potential dates in mind, as these tend to book up quickly at desirable venues. Be sure to also check in with your immediate family and closest friends to make sure there aren’t any direct conflicts. If there’s a band you’ve always had your heart set on, why wait? “The earlier you get started, the better!” says Jessica. “Good vendors book up fast!” Key vendors include your photographer, DJ or entertainment, and officiant. Check out O&B’s list of preferred suppliers for a little extra inspiration! Whether you’re planning a big blowout wedding or an intimate ceremony, you need to get a handle on your head count. Give yourself lots of time for this step, as balancing your numbers to fit your wedding budget and venue capacity is no easy feat. It will also take time to collect your guests’ mailing address (or email addresses!) for Save the Date invitations. This is a great way to kick off your celebrations, but it’s not always 100% necessary. 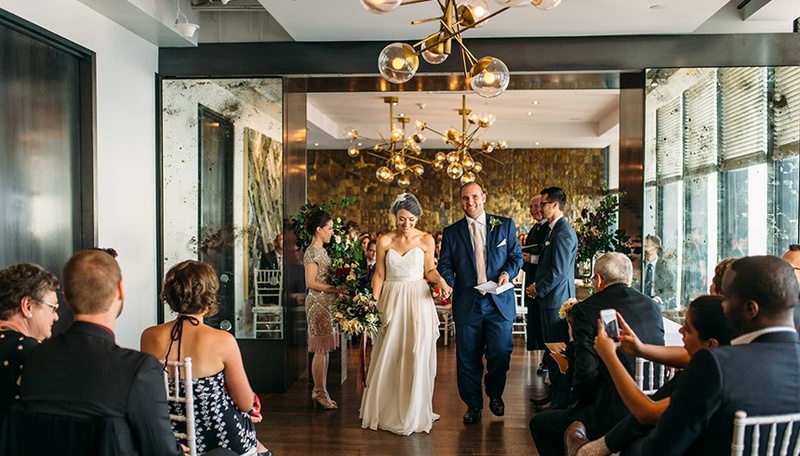 “Deciding whether you and your fiancé should have an engagement party depends on what you both want,” says Julie Stulberg, an Event Specialist at The Carlu. From a small gathering at someone’s home to lively cocktail party at a restaurant, you can customize your engagement party to suit your taste, style, and budget. While this is another completely optional step, engagement photos can be a great accompaniment to your Save the Date invitations, or your wedding website. “The engagement session is also the perfect opportunity to spend some time with your photographer before the wedding day,” says Julie. 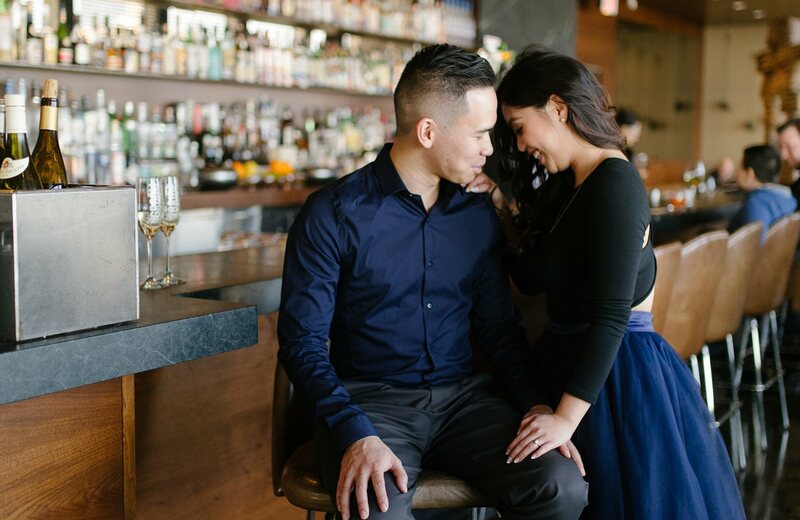 “Your photographer also gets to see how you and your fiancé interact with each other, and can better direct you two.” Personally, we loved hosting Jolyn and Carl’s lovely engagement shoot at the bar at Canoe! This could be as simple as starting your own Pinterest board, scrolling through Instagram, or flipping through bridal magazines. There’s no better way to immerse yourself in all things weddings. From gorgeous stationary ideas to floral trends, a wedding show will get you dreaming and scheming about the big day. Our team at The Carlu will be hosting The WedLuxe Show in Toronto, and the newly opened Hudson will be hosting The Bash in Calgary!